I managed to catch a set by the Rich Halley Group, which was neat. Halley, a saxophonist, played with a trombonist, bassist, and drummer. I’m not usually a big fan of really free jazz, but I found it was a lot more approachable when I could see the musicians cue off of each other. But the real reason I was there had to do with the headliner: David Haney was playing with bassist Andre St. James, and a drummer named Bernard “Pretty” Purdie. As a drummer, I’ve been a fan for a long time — I’ve been listening to tracks he’s recorded for most of my life (I’ll bet you have, too. Check out a list of his top 100 tracks.) But I’ve never seen him live. The trio was great. Haney actually took the stage wearing a winter coat, a sport coat, and a scarf, like a commuter on the bus. But Haney plays piano unlike almost anyone I’ve ever seen — his right foot taps, his legs kick out, and he lurches around on the bench. If there’s such a thing as a physical piano player, he is one. All that motion warmed him up, and he took off the jacket, then peeled off the sport coat during a song. One song later, the scarf joined the jacket and the coat on the floor next to the piano. It was like the dance of the seven veils. As good as Haney and St. James are, I was mostly focused on Purdie. For the most part he was just comping, and didn’t even solo. But even compared to the drummer that preceded him, Purdie was smoother, his time was perfect, and his dynamics (variation in volume) were just effortless. He was so technically adept that when he was playing a fill, his hands would just bring his idea to life. 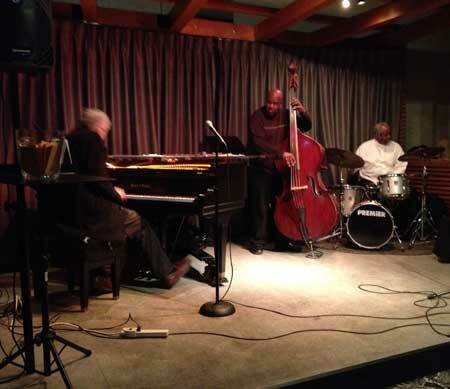 Purdie is now 73, so I’m feeling lucky that he came out one night to help out his friend’s jazz festival. I can only hope he decides to do it more often.